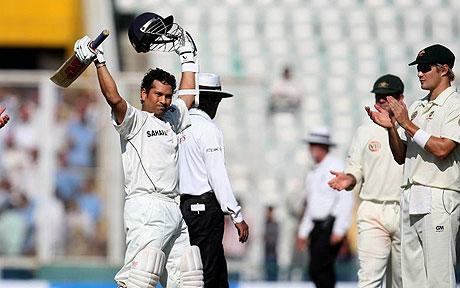 If ever a destiny was writ in stone it was that Sachin Tendulkar would one day become Test cricket’s leading run-scorer. Ever since he made an unbeaten 326 in a school match, supreme greatness has been predicted and now, on the first day of India’s second Test against Australia in Mohali, that karma has finally come to pass. Having failed to break the record in Bangalore, Tendulkar needed to wait until the first ball after tea to exceed the 11,953 runs made by Brian Lara. Needing 15 at the start of his innings, he passed his old rival with a guide for three to third man off the relatively unknown seam bowler Peter Siddle, hardly a box office combination with which to crack cricket’s blue riband feat. Tendulkar‘s celebrations, a couple of glances to the heavens, no doubt to thank his peers in the vast pantheon of Hindu gods, were more muted than those around him. Otherwise it was firecrackers and a standing ovation from the adoring crowd and handshakes all round from the Aussies. Sachin Tendulkar broke Brian Lara’s record for most Test runs in the final session of day one in Mohali when he hit Peter Siddle to third man for two runs. 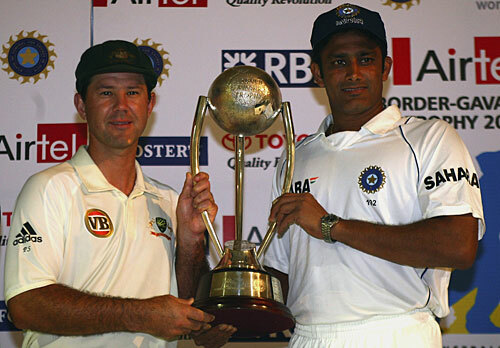 The record stood for nearly two years after Lara played his final Test and it was inevitable that Tendulkar would eventually break it. Incidentally, he is also one-day cricket’s leading run-scorer with 16,631 runs. Tendulkar was expected to attain the feat in Sri Lanka recently but he endured a poor series with the bat, scoring just 95 runs in three Tests. It was only fitting, though, that he achieved the record against Australia, a team he has tormented several times in the past. Aus 430 all out. They may be some 100 runs short. Superb ton by Mr cricket though. The Indian Cricket League (ICL) on Friday announced the prize money corpus of Rs.13.72 crore for its October 2008 edition of ‘ICL 20s Indian Championship’ at a press conference here. The winners of the tournament stand to gain Rs. 2 crore while the runners-up will cash in Rs. 1 crore. The incentive for individual performance during the 41-match tournament will be an impressive Rs. 2 lakh for Man of the Match and a humongous Rs. 40 lakh for the Man of the Series. Besides, team winning per match in the league stage will get Rs. 25 lakh and the loosing semi-finalists will stand to win Rs. 50 Lakh. Live India Vs Australia First 1st Cricket Test From Chinnaswamy Stadium Bangalore Online free- India Vs Australia cricket test series which starts from october 9th at Chinnaswamy stadium Bangalore the I.T. Capital of India has many special significance. First amnd foremost This India Vs Australia series at the home land is going to be the Final test of DADA the ever green former captain of Indian Team Sourav Ganguly. Having won 21 test matches of a total number of 49 played sourav is very much part and parcel of Indian Cricket history and we are going to miss this Tiger badly in the comuing days. Good Luck Tiger and Best wishes in Advance. Sourav Ganguly said yesterday he would retire from international cricket at the end of the upcoming four-Test series against Australia. Vinod Kambli is in lime light recent times. First, it was his wedding and now it’s the new reality dance show on Colors. It’s Vinod Kambli’s second marriage and he was introduced to Andrea Hewitt through a common friend. Senior nose tackle Terrance Taylor wasn’t going out like that. With the Michigan football team trailing 19-0 at halftime to No. 9 Wisconsin, Taylor was running through the tunnel when his frustration boiled over. He started yelling, trying to motivate his teammates — especially the offense, which had just 21 total yards and one first down to that point. He kept talking once the Wolverines reached the locker room until the coaches arrived. Taylor’s impromptu pep talk worked. Michigan (1-0 Big Ten, 2-2 overall) rallied to beat the Badgers, 27-25. The win was the Wolverines’ largest comeback at Michigan Stadium. Shivnarine Chanderpaul has become the fifth player to be named as the ICC Cricketer of the Year at the ICC Awards ceremony in Dubai. Chanderpaul, who also made the shortlist last year, fought off competition from other nominees Mahela Jayawardene from Sri Lanka, as well as South Africa’s Graeme Smith and Dale Steyn to take the top award. Steyn had the consolation of taking the Test Player of the Year award, while India’s one-day captain Mahendra Singh Dhoni won the ODI Player of the Year award. Yuvraj Singh became the inaugural winner of the Twenty20 International Performance of the Year Award in recognition of his amazing six sixes in one over off Stuart Broad during the ICC World Twenty20 in South Africa last September. Ajantha Mendis, Sri Lanka’s 23-year-old spin star, won the Emerging Player of the Year award. With his mesmerising brand of spin bowling, Mendis has exploded on to the international scene in recent months. 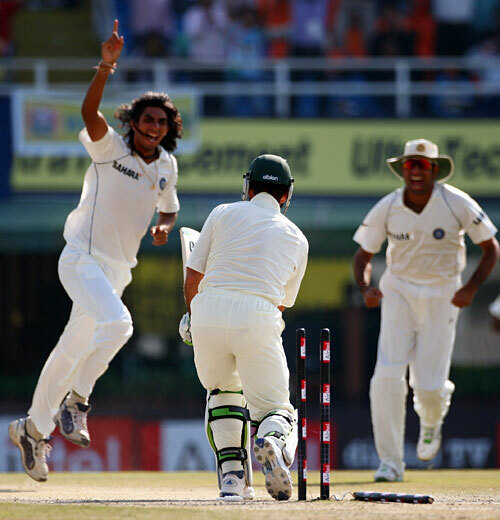 In just three Tests against India in July and August, he claimed an amazing 26 wickets at an average of 18.38. Australian umpire, Simon Taufel, was named as Umpire of the Year for the fifth successive time. Taufel, 37, received his votes from the captains of the ten Full Member nations, as well as the eight-man elite panel of ICC match referees. “I’m delighted to win this award but I don’t set this as a goal at the start of a season,” he said. Yuvraj Singh, became the inaugural winner of the Twenty20 International Performance of the Year Award, in recognition of his amazing six sixes in one over during last September’s ICC World Twenty20 in South Africa. This new award highlights the most impressive performances by players in Twenty20 Internationals during the 12-month voting period and it marks the advent of this exciting new format of the game at international level. 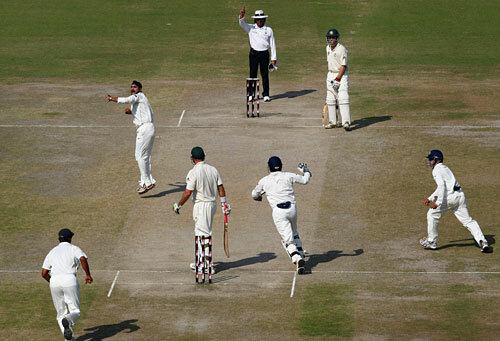 On September 19, 2007, during a match against England in Durban, Yuvraj Singh smashed every delivery of the 19th over – bowled by Stuart Broad – beyond the boundary rope, in the process registering a 12-ball half-century and putting his team on course for victory. It was the first time a player had hit six sixes in a single Twenty20 International over. Herschelle Gibbs did it in an ODI during the 2007 World Cup in the West Indies, while Garry Sobers became the first batsman to achieve the feat during a first-class match back in 1968. Mahendra Singh Dhoni, has won the ODI Player of the Year award at the ICC Awards ceremony in Dubai. Dhoni beat off tough competition from his India team-mate, Sachin Tendulkar, Australia’s fast bowler Nathan Bracken and Pakistan stalwart, Mohammad Yousuf, to take the award. During the voting period, Dhoni played 39 ODIs and scored 1,298 runs at an average of 49.92 and at a rate of 82.46 runs per 100 balls faced. In that time he hit a century and nine fifties, making sure he led his team from the front. Also in that time, in his capacity as a wicketkeeper, Dhoni claimed 62 dismissals (46 catches and 16 stumpings), which is almost twice as many as the next best, albeit having played more matches than any other keeper. He is currently ranked No. 1 in the ICC Player Rankings for ODI batsmen. Dhoni said: “I would like to thank the voting academy for considering me to be deserving of this award. I am really happy to get this – it’s a great privilege. It’s amazing how creative producers are when it comes to coming up with reality programs that showcase not just something interesting out of the ordinary lives of some, but also entertains us with the sometimes wacky, at times overly dramatic real life events of individuals who bare their hearts and souls to the camera. Like any other reality series, Dallas Cowboys Cheerleaders pits individuals to compete for a spot in one of the most admired dance groups in the country. Last season, we not only saw a fresh batch of aspiring dancers, but also some familiar faces who have returned for another shot at fame, like Meagan Flaherty, Natalie Woods, Candice Carr and Miranda James. Viewers would be glad to know that the Dallas Cowboys Cheerleaders: Making the Team is returning for a third season. Get ready for So You Think You Can Dance, cheerleader style! CMT announced today that Dallas Cowboys Cheerleaders: Making the Team is returning for its third season on October 4, Saturday at 9:30pm. Like the previous seasons of the reality series, the third installment will look into cheerleading tryouts for one of NFL’s most popular teams. As per usual, the auditions will begin with a thousand or more vying to move on to the next phase of the competition at the team’s Texas Stadium. Throughout the course of the series, several challenges will be thrown at them, and depending on how they will be handling it, some will have to be dropped from the competition. J.G.W. Davies was a distinguished classical scholar who became the chief psychologist at the War Office during the Second World War, secretary of the Cambridge University appointments board, an executive director of the Bank of England and treasurer and president of MCC. He opened the batting for Kent, played rugby for Blackheath and was three times the British (and therefore world) champion at Rugby fives. Yet he was best known for none of these things because, in 1934 at Fenner’s, he bowled Donald Bradman with an off break for the first nought he had ever made in England. It was but one small measure of the extraordinary fame of the batsman born in Cootamundra, New South Wales, 100 years ago today. No wonder another relatively obscure cricketer who once dismissed him, Bill Andrews, of Somerset, entitled his autobiography The Hand that Bowled Bradman. Both because of the time in which he lived and the prowess with which he played, the most influential Australian who ever lived reflected glory like no other sportsman. Defeating him was like coming from behind to beat Tiger Woods in the last round of the Open, or outpacing Usain Bolt over 200 metres. Coco Vandeweghe of the United States reacts after losing a point to No. 2 seed Jelena Jankovic of Serbia during their match at the U.S. Open tennis tournament in New York on Monday, Aug. 25, 2008. Vandeweghe was defeated 6-3, 6-1.